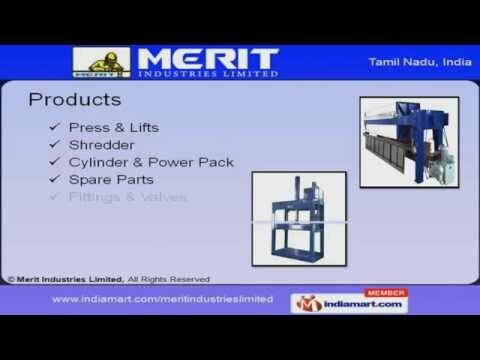 Welcome to Merit Industries Ltd. Manufacturer & Exporter of Hydraulic Press & LiftsThe company was incorporated in 1996, at Coimbatore. We cater to Automobile & Construction Industry and have our major markets in Indian Subcontinent, Middle East& other countries. Our Specialized R& D wing, stringent quality review & Wide distribution network make usstand apart from also-rans. We offer a vast range of Shredders, Power Packs, Lifts & Spare Parts. Press & Lifts offered by us are well known for their outstanding performance. We also provide Shredders that are a class apart. Our Cylinder & Power Packs are sturdy in construction and highly durable. Along with that we offer Spare Parts that are extremely reliable. Our clients can avail from us a qualitative range of Fittings & Valves.